To brilliantly match the title of the book, there is a single strong message through this book, that is: for companies to be successful, they must have a purpose that drives the strategy and values through all levels of an organization. Mourkogiannis explores the way companies can make purpose and morality rooted in the adventures that they take through intellectual curiosity. It ties closely to innovation and I love how the author relates discovery to a choice that enables freedom and opportunity to discover a new world. Excellence means holding up high standards and great expectations of performance both internally and in the community of the business. When a business exists primarily to serve its customers beyond the normal expectation or obligation tied in by a contract. Heroism is when a company can demonstrate great achievement and success despite the challenges and setbacks it faces. These wrap up the implementation of purpose into strategy very well and give the reader a lot of food for thought on their own business strategies. There is plenty of wise advice throughout this book and one that you will certainly enjoy if you are planning strategy and guiding any significant portion of a company. There is certainly a lot of wisdom for an individual perspective as well, even for entrepreneurs, but it is never really explored in that sense within the book, which is something I would have liked to see more of as I think it is much more common with that segment of business on the rise. Seems to me that this book could apply to people as well. If we as a people are going to survive, we too need a purpose. I like your review format Mike! Jay, it certainly does. It covers themes that not only let you discover your purpose, but also live it to the highest standards. I would have liked to see Mourkogiannis make more personal associations to the work concepts but I can understand the attention to work for his context. There is much wisdom in this one if even if you aren’t planning to be CEO anytime. Keep in mind you ARE CEO of your life, and much the same applies! I appreciate the feedback Jay. Thanks. Mike, I’m getting this book, even though I’m approaching 50 I still haven’t read. 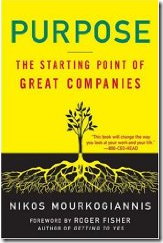 Purpose drives everything in individuals and so too in organizations. Discovery, Excellence, Altruism, and Heroism – Four wonderful themes. I can’t wait. Thanks for bringing this to our attention. I’m going to read your archived reviews. Thanks for this book review. I’m ALWAYS looking for new reading material, and I have a feeling we share a love for similar topics. 🙂 Since I’ve been working on my business (aka focusiness) I’ve noticed that it’s much easier whenever I tap back into my original vision and purpose. I’m going to add this book to my “to-read” list, just to re-energize my business purpose again. Thanks Stephen and Nathalie for the comments. It’s great to help promote such excellent books and you’ve both noted great reasons why you want to read it. You might want to consider browsing through my archives for previous book reviews and also through my bookstore where I have all these books in a US and Canadian amazon bookstore for purchase as well as in the audio CD group when I can find them. I have noticed a popularity in books dealing with the beginning of various processes or projects, and it makes sense that the focus is there, since a successful start to any procedure speaks volumes about how it will be in the long-term. An initial success can be built upon for ages, if not only by re-informing people about how successful the start was. On the point about Excellence: Virtue’s Fulfillment, I have been reading The Economist lately, and see that their system of putting out information has put them in the upper echelon of mass-produced publications. Much of their rhetoric makes incisive use of certain phrases, in order to keep a point that they made stick in the reader’s mind as attached to the issue they were talking about. This book is awesome. I read it a while ago and it has tons of great ideas for building a business of any size as well as an empire of wealth! Hi Mike, I think this is a very good book with examples of famous corporations. I didn’t read the book yet,but was inspired to take it because I want to be SEO in my life. Don’t Judge Others, Be Helpful Instead!